Increasing the compression ratio of an engine is one of the best ways to increase horse power and torque. There are three basic ways this can be done. Mill the heads to increase the compression ratio. This is a simple, easy way to increase the compression of the engine without having to disassemble the top end. For street engines with bolt-in cams, limit the milling to .050 inches. When the engine is assembled, use one of the .030 inch thickness head gaskets instead of the normal .040 or .060 inch gaskets. This will give the engine a mechanical compression ratio of almost 9.5:1. This is considered the minimum compression ratio needed to make serious power from a Harley-Davidson engine. Change to a domed piston. This method of increasing compression is more expensive, but more flexible than milling the heads. Most high compression pistons will come with valve relief's allowing the use of high lift cams. This JE domed piston raises the compression in a stock combustion chamber to 10.5:1. 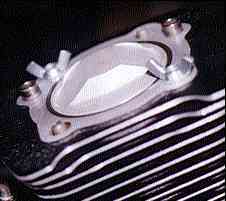 JE and Wiseco both make high compression pistons for H-D engines that do not require machine work on the heads. Unless the engine is an all out race engine, limit the compression to 10.5:1. Compression ratio's higher than this can be prone to detonation, even with long duration camshafts. Welding up the combustion chambers and reshaping the chamber. This has to be considered the most expensive way to increase compression. It also requires the most expertise to properly perform the required work. Reshaping combustion chambers is most effective when performed by an experience engine builder. When modifying an engine, it is important to match the compression ratio with the duration of the cam. While additional cam duration can produce more useable power, to much duration can hurt the performance. The problem is created when too much duration results in lower cylinder compression pressures at low RPM which reduce the low RPM torque and power. Below is a chart that provides guidelines for engine performance for a given range of static compression pressures. These should provide a good means of judging if the cam installed in the engine matches the other components. Less than 115 PSI Poor low speed performance, poor throttle response, hard starting. Compression Ratio and Cam not matched or worn rings, valves. 120 PSI to 145 PSI Expected range for most stock or modified street motors. This is a good range for a street motor. 145 PSI to 165 PSI Modified street motors. Static pressures in this range should produce good results. This is a good range for a street motor. 165 PSI to 180 PSI Marginal for street motors. Possible hard starting, detonation and overheating. Over 180 PSI These are all out race engines. A street motor in this range will be trouble. Stick to the track.